heartwarming spices will only make you feel better to get through your sickness. Hello friends, how is this cold weather treating you? Well I am loving it. I am loving being indoors , snuggling into a blanket with my son reading his favorite book and enjoying a cup of hot cocoa or a soup. I am loving the long walks with my husband in this misty weather with light drizzle and cold breeze, oh so romantic ! But this season marks the beginning of allergies too , the cold virus is all over the place. Especially the kids ,they get it so often these days . So this season juices are replaced by soups . We crave more and more warm foods and that is better too. Warm foods help building immunity in cold weather. I am sharing this recipe just in time with you . 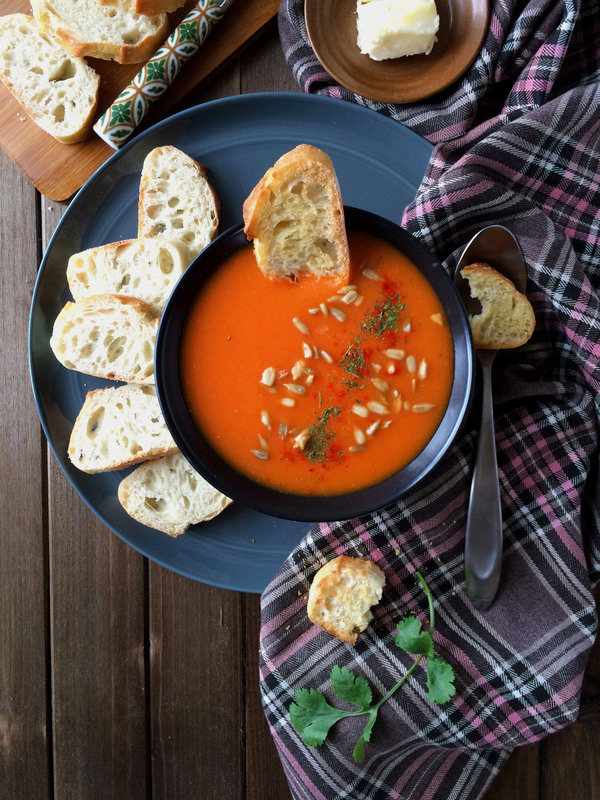 – apple carrot soup – a delicious soup which I call it feel better soup. We are very fond of carrot apple juice , I make it a lot during summer. So I thought why not carrot apple soup , it’s perfect for this cold weather too. I call this as a feel better soup because it is infused with spices which have great healing properties in turn making you feel really really better . This soup is full of vitamin C and essential nutrients that is much needed to combat cold and allergies. This delicious bowl of goodness requires less than 10 ingredients and takes only 10 minutes of preparation, rest is simmering . If you are looking for a drink that makes you feel good not only in taste but also from within, then you might want to include this in your meals. It makes a wonderful side or a light snack . Carry it to office for a light lunch or have it between meals. We had it today with a side of toasted French bread and some quick spaghetti. I have a delicious recipe of express spaghetti – find recipe by clicking here. I have even topped the soup with roasted sunflower seeds and red pepper for extra kick and crunch . So what is this soup made of ? Apples are available all year round , but fall is the season of apples and pumpkins – the best season to enjoy variety of apples in variety of ways. I always stock up on apples – makes a great snack anytime. And as you know an apple a day keeps the doctor away, so why not use it as a ingredient in a soup. firstly – my son doesn’t like raw carrots so it has to be hidden in his food in some form or the other and I make sure he has his portion of veggies without fuss . secondly – carrots come with truckload of benefits. It’s a great source of Vitamin C , vitamin K , iron , beta carotene , fiber , potassium – well you name it and it has it. So make sure to add loads of carrots in your diet in form of salads, soups , veggies ,stews , sauces , snacking or even as a filling in your parathas. we eat a lot of ginger everyday , starting from morning tea to adding in daily cooked veggies. Ginger is a great addition to your foods especially in winters. It has amazing curing properties to fight cold and flu . It plays an important role in fighting infections too. So make sure you add it in your diet. Garlic is proven time and again to fight cold , infections and have other impressive medicinal properties. Needless to say it can make any dish taste way more delicious . So make sure to include it too. I have used turmeric , cinnamon , peppercorn and cayenne pepper as spices. Not only do they enhance the taste , they also ease out the cold symptoms . These spices come with great healing properties too which makes it a must to consume them for better health . perfect ingredient to include in your daily meals especially when you are unwell. Rich in anti oxidants , honey is a great energy booster, relieves cough and cold , fights allergies and has so many more benefits. lemon means adding more vitamin C which in turn helps fighting cold and infections. It helps building immunity and fights fatigue. And a dash of lemon can make any food taste refreshing. So in short you can say this is an ideal winter soup which is delicious, healthy and benefiting in every way. I have already made it twice last week and we are absolutely loving it. I am happy to share this recipe with you hoping you will definitely benefit from it. Make a big batch and freeze for a quick-lunch box addition or for those evening hunger pangs. Vegan if agave used instead of honey. An ideal soup to combat allergies, cold flu symptoms - a perfect feel better soup you will ever have. In a large pot bring some water to boil. In the meantime , peel the carrots and apples , core the apples and dice everything. Once the water starts simmering add the cut veggies, peppercorns, cinnamon , grated ginger . Cover and let it cook until soften. Return to the pot . Add salt, freshly grated garlic , turmeric and red pepper . Taste test and adjust the spices or the consistency. Switch off the flame and squeeze in some lemon juice. Use all or skip any of the spices according to your preference. You can add any other veggies like tomatoes , bottle guard , spinach to it. top it with your choice of toppings or totally skip it. you can prepare this soup in a cooker too. hope you like this recipe and do give it a try. I would love to hear from you. If you have tried any of my recipes make sure you click pictures of your hard work and do drop in a feedback below and pictures on my Facebook page carveyourcraving in messages section. Follow me on instagram and pinterest too . Could this be made in an InstantPot? Kavita I am so glad to hear that , congratulations on your engagement , keep up the enthusiasm , happy cooking dear. Let me begin by saying I have been following all (or mostly all)_your recipes from CAL for a very long time now, but yesterday was the first time I actually tried one! When I started going through your post, I was sold at Carrot Apple juice in a soup. I love making fresh juices at home, and I just happened to have a bunch of carrots and 2 apples lying around in the fridge for a while now waiting to be juiced. I knew I had to make this recipe asap as soon as I saw it. Oh my,, this was FANTASTIC! My fiance complimented me after the meal saying my cooking skills have improved tremendously since we first started seeing each other 10 months ago (obviously he took credit for it) , But seriously, thank you for the amazing recipe, I’m going to try making this atleast once a week and savor the goodness my favorite combo this winter! Looks so scrumptious !! Surely will try it soon.